WHO NEEDS TO SIGN A COMMERCIAL LEASE IN ORDER TO MAKE IT ENFORCEABLE? JUST AS IN OTHER LEGAL CONTRACTS, CORPORATE AUTHORITY AND THE ENFORCEABILITY OF THE SIGNATORIES MUST BE CONSIDERED WHEN NEGOTIATING A LEASE. THE QUESTION OF WHO MUST SIGN A LEASE IN ORDER FOR IT TO BE ENFORCEABLE IS A QUESTION OF STATE LAW AND THE TERMS OF THE GOVERNING DOCUMENTS OF THE BUSINESS LEASING THE RENTAL. UNLESS A TENANT CAN PROVIDE PROOF THAT THE PERSON SIGNING THE LEASE IS IN FACT AUTHORIZED TO DO SO, A LANDLORD IS AT RISK OF A CLAIM THAT THE LEASE WAS NOT DULLY AUTHORIZED AND IS THEREFORE NOT BINDING. IT IS ALSO IMPORTANT TO CONFIRM THAT THE TENANT ENTITY IS IN GOOD STANDING IN THE STATE WHERE IT WAS FORMED AND IS QUALIFIED TO DO BUSINESS IN THE STATE IN WHICH THE PREMISES ARE LOCATED. WE ARE HERE TO HELP YOU AND YOUR CLIENTS! THERE ARE NO WARRANTIES, EXPRESS OR IMPLIED, INCLUDING FITNESS FOR A PARTICULAR PURPOSE, MADE WITH RESPECT TO THIS COMMUNICATION. NOTHING FOUND HEREIN SHOULD BE CONSTRUED AS AN ATTEMPT TO OFFER OR RENDER A LEGAL OPINION OR OTHERWISE ENGAGE IN THE PRACTICE OF LAW. YOU SHOULD OBTAIN THE ADVICE OF AN ATTORNEY WELL VERSED IN THESE MATTERS. IN A COMMERCIAL LEASE, QUIET ENJOYMENT IS THE MOST FUNDAMENTAL AND OFTEN MISUNDERSTOOD RIGHT OBTAINED BY A TENANT. THE COVENANT OF QUIET ENJOYMENT MEANS MORE THAN JUST A NOISE-FREE ENVIRONMENT. IT IS A MORE TROUBLESOME OBLIGATION THAT PROVIDES THAT THE LANDLORD WILL NOT INTERFERE WITH A TENANT’S RIGHT OF POSSESSION OR TENANT’S ENJOYMENT OF THE LEASED PREMISES. IN MOST LEASES, THE COVENANT IS WRITTEN IN THE LEASE DOCUMENT, SETTING OUT THE PARAMETERS FOR QUIET ENJOYMENT. We are here to help you and your clients with all aspects of commercial property management. Please contact us for further assistance! Potential property and premises liability is everywhere. A slippery or uneven floor, sidewalk or parking lot that leads to a slip, trip or fall; a cluttered exit that prevents prompt evacuation in the event of an emergency; a visitor who is robbed or assaulted on your property: these are but a few examples that could pose hazards to public safety. Th e public trusts and expects that their experience in and around the buildings you own or manage will be a safe one. In fact, if you fail to consider the public’s safety, you could be held financially liable. Many slips, trips and falls are no accident; many can be avoided with an effective slip, trip and fall prevention program. Ensuring the public has safe egress from your building in the event of a fire or other emergency is critical. In addition, securing your property to help prevent theft, assault and other acts of violence that could cause harm or injury is key to ensuring public safety. Knowing the circumstances and situations that can potentially impact public safety, planning for them and helping to ensure adequate risk mitigation strategies are in place can help protect you, the reputation of the property and the bottom line. Engineering repairs can cost up to tens of thousands of dollars. Preventive maintenance is key to ensuring building mechanicals (heating and air conditioning systems, chillers, fan motors and variable air volume boxes, etc.) don’t break down unexpectedly. Create a preventive maintenance schedule to make sure everything runs smoothly. If properly inspected and lubricated, most equipment should last 25 to 35 years. We are here to help you with all aspects of commercial property management. Please contact us for further assistance! ONE OF THE COMMON CHALLENGES OF MAINTAINING A COMMERCIAL FACILITY IS ENERGY EFFICIENCY. WITH SO MANY TENANTS TO MANAGE, IT’S DIFFICULT TO MAKE ENERGY EFFICIENCY A PRIORITY. WATCH OUT FOR ENERGY EATERS. TRY HAVING YOUR CLEANING CREW COME IN DURING THE DAY WHEN LESS ARTIFICIAL LIGHT IS NEEDED AND CONSIDER USING OCCUPANCY SENSORS TO ENSURE LIGHTS ARE NOT BEING USED UNLESS SOMEONE IS IN THE ROOM. IN ADDITION, YOU CAN INVESTIGATE WHETHER ELECTRONIC EQUIPMENT THROUGHOUT THE BUILDING OFFERS AN “ENERGY SAVINGS” OPTION. WE ARE HERE TO HELP YOU AND YOUR CLIENTS WITH ALL ASPECTS OF THE RENTAL MARKET. PLEASE CONTACT US FOR FURTHER ASSISTANCE! IN A COMMERCIAL LEASE, DOES “AS IS” REALLY MEAN THAT THE TENANT TAKES THE PREMISES “AS IS”? EVEN THOUGH THAT MAY BE THE INTENTION OF THE PARTIES, THERE MAY BE LAWS THAT PRECLUDE A LANDLORD FROM COMPLETELY PASSING THE BUCK ON CERTAIN ISSUES, SUCH AS ENVIRONMENTAL CLEANUP AND HAZARDOUS WASTE. ALSO, THE LAW SOMETIMES REQUIRES MANDATORY DISCLOSURE OF DEFECTIVE CONDITIONS OR OTHER PROBLEMS WITH THE PREMISES OR PROPERTY. 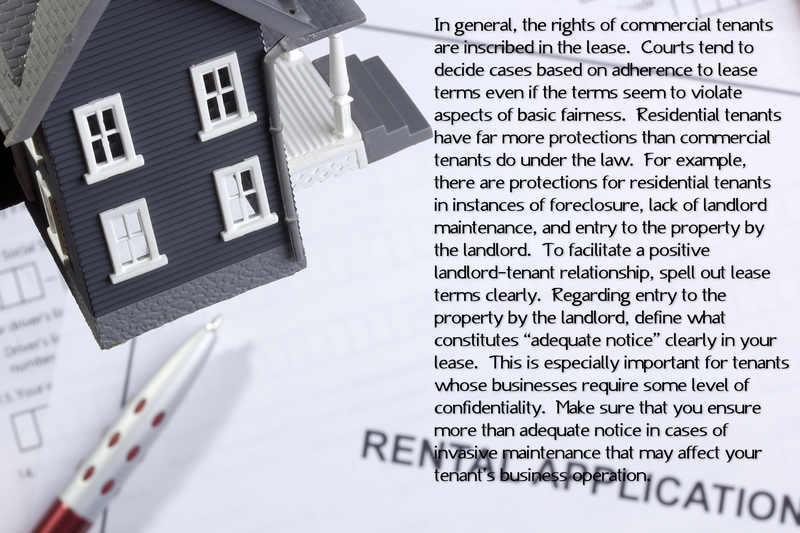 A landlord and tenant must pay particular attention to the “Repairs and Maintenance” provision of a commercial lease. Landlords may try and to this provision to require the tenant to repair and maintain areas located outside the leased premises. A typical commercial lease will define tenant’s repair and maintenance obligations with reference only to the interior of the premises. However, depending on the definition of the premises, this may result in the tenant having to repair and maintain such things as fire sprinklers, heating and cooling ducts, and the building’s structural elements. It is important that the lease be specific about who is responsible for the repair and maintenance of specific items so that there is no doubt as to which party has responsibility. Nothing found herein should be construed as an attempt to offer or render a legal opinion or otherwise engage in the practice of law. You should obtain the advice of an attorney well versed in these matters. One of the pitfalls for a commercial tenant regarding their lease is the “Termination, Relocation or Expansion Rights” provision. Although reading a commercial lease can be difficult and time-consuming, the consequences of not reading can be more unpleasant or potentially disastrous. A tenant who has not had their lease carefully read may be surprised to learn that the landlord has reserved the right to unilaterally terminate the lease or relocate the tenant. An expansion provision may give another tenant the right to expand into the tenant’s premises and/or may allow the landlord to terminate the tenant’s lease. Ideally, a tenant should not agree to such clauses. Some of the top legal/liability issues impacting landlords and commercial property managers include debt collection and frivolous lawsuits. “Slip-and-fall” accidents and frivolous lawsuits rank high in top causes of disputes. Some suggest that the economy has lead more people to try to cash in on slips and falls. As in debt collection, it is beneficial for a landlord to have a properly trained property manager to handle these type of issues. We are here to help you and your clients with all aspects of the Commercial rental market. Please contact us for further assistance! What does NNN (Triple Net) mean in commercial leasing? In commercial leasing rents are often quoted as being NNN or Triple Net. In a Triple Net lease, in addition to the quoted rental rate, the tenant is responsible for a specified percentage of the operating expenses and real estate taxes associated with the property. NNN refers to Maintenance, Insurance and Taxes. Maintenance generally covers the maintenance of the property, including landscaping, common area utilities and property management. Because different landlords might include or exclude certain expenses from their definition of NNN, it is important to ask the for a specific list of included expenses in order to be able to accurately predict operating expenses. We are here to help you and your clients with all aspects of commercial property management. Please contact us for further assistance. WHO NEEDS TO SIGN A COMMERCIAL LEASE? JUST AS IN OTHER LEGAL CONTRACTS, CORPORATE AUTHORITY AND THE ENFORCEABILITY OF THE SIGNATORIES MUST BE CONSIDERED WHEN NEGOTIATING A LEASE. THE QUESTION OF WHO MUST SIGN A LEASE IN ORDER FOR IT TO BE ENFORCEABLE IS A QUESTION OF STATE LAW AND THE TERMS OF THE GOVERNING DOCUMENTS OF THE BUSINESS LEASING THE RENTAL. UNLESS A TENANT CAN PROVIDE PROOF THAT THE PERSON SIGNING THE LEASE IS IN FACT AUTHORIZED TO DO SO BY PROPER ACTION, A LANDLORD IS AT RISK OF A CLAIM THAT THE LEASE WAS NOT DULLY AUTHORIZED AND IS THEREFORE NOT BINDING. IT IS ALSO IMPORTANT TO CONFIRM THAT THE TENANT ENTITY IS IN GOOD STANDING IN THE STATE WHERE IT WAS FORMED AND IS QUALIFIED TO DO BUSINESS IN THE STATE IN WHICH THE PREMISES ARE LOCATED. COMMERCIAL PROPERTY MANAGEMENT IS JUST A CLICK OUR CALL AWAY!